A new memorial fund seeks to raise $1 million to honor the life and legacy of Hawaii visionary, Guy Toyama. Sustainability grants and scholarships will foster positive change worldwide, and advance innovation and entrepreneurship in areas of environmentally sound practices in Hawaii and around the world. The Guy Toyama Memorial Fund will provide scholarships for students interested in sustainability and entrepreneurship. In addition, the fund will provide grants for non-profit projects focused on innovation and sustainability integration. The fund will create positive outcomes for future generations through disciplines such as renewable energy, local food production, and waste reduction. 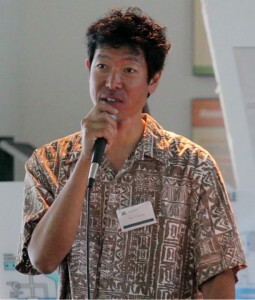 Toyama, a Hawaii visionary and champion of sustainable business and renewable energy, passed away in November of 2012. In honor of his longstanding commitment to improving the relationship between people and the islands, his never-ending spirit of kuleana will be carried on through the fund. “Guy’s gift of generosity and his passion for positive social and environmental change were contagious. The memorial fund celebrates his enthusiasm and his unending dedication to the community,” said Debbie Baker, Chair of the Board of Directors of the Kona-Kohala Chamber of Commerce. Visit www.fofhawaii.org and click on the DONATE link to contribute online using PayPal or a credit card. Include “Guy Toyama Memorial Fund” in the “note to seller” field when you review the PayPal transaction. Requests for additional information can be addressed to info@guytoyamafund.org. Photo courtesy Simple Solutions for Planet Earth and Humanity.